APRIL 2018 • E&MJ 79 www.e-mj.com OPERATING STRATEGIES the end, it's going to help protect people and property." Over and Above High-fl ow Performance Beyond achieving the NFPA 10 minimum 1-lb/sec fl ow rate, cartridge-operated fi re extinguishers offer additional performance enhancements. In comparison to stored pressure extinguishers, cartridge-operated models offer safety personnel the ability to recharge the extinguisher on site with- out the need for a trained service techni- cian. This means operations can resume within minutes after an extinguisher has been discharged in response to a fi re. Ergonomic design features of car- tridge-operated models also enhance and optimize the operator's effective- ness against Class B fi res. 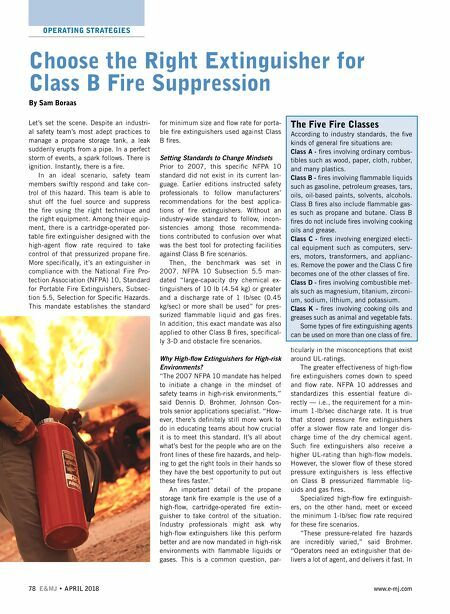 Whether it is easier hand portability with 45-degree-an- gle carrying handles, or greater accuracy with specialized nozzles designed to point at the base of the fi re when squeezed, high-fl ow, cartridge-operated fi re extin- guishers give personnel the higher level of performance they need to comply with NFPA 10 standards. Rae Lynn Kolbas, Johnson Controls global product manager, added, "Let's face it, these environments are tough. The high- est quality cartridge-operated extinguish- ers are going to be the ones that withstand the everyday abuses of these industrial settings. This means heavier gauge steel shells, fewer potential leak paths, and as a direct result of the cartridge operation, these extinguishers naturally resist the agent compaction effects of vibrations." Moving Forward in Class B Fire Settings All fi res, whatever the classifi cation, re- quire urgent and appropriate responses. However, pressurized fl ammable liquids and gasses, gravity fed or obstacle fi res all necessitate a unique and specialized response. NFPA 10 gives industrial safety teams a simple, vital tool to assess pre- paredness levels of their operations: An easy to follow standard for 1 lb/sec of agent fl ow rate. What this simple standard reinforces about Class B fi re scenarios is simple: speed, time and technique all matter — and agent fl ow rate makes a critical difference. Sam Boraas is director of portable fi re ex- tinguishers and agents, fi re suppression products at Johnson Controls. Johnson Controls' product offering includes Ansul Red Line cartridge-operated, high-fl ow fi re extinguishers. Toolkit Designed to Help Companies Improve Human Rights in Confl ict Areas A "toolkit" brochure recently published by International Alert, a London, U.K.-based nongovernmental organization, is aimed at helping companies understand how specifi c confl ict environments affect their impact on human rights, and the ways in which they should conduct their human rights due diligence depending on the type of confl ict they operate in. According to International Alert, it offers concrete actions to help companies improve stake- holder management, identify confl ict risks and contribute to peace in fragile areas. "This toolkit builds on International Alert's ground-breaking work over the past two decades to engage the private sector in building peace. In areas hit by confl ict, human rights violations are more likely to happen, and those violations will be more severe than normal," said Harriet Lamb, CEO of International Alert. "Working together with the extractives industries, we have tried to support them to address human rights issues and to be mindful of their impact on confl ict. 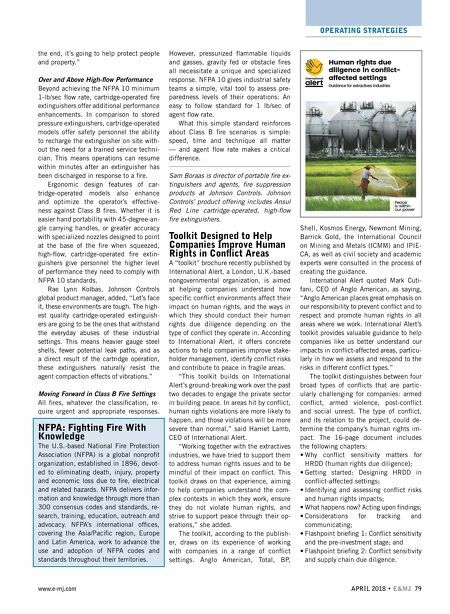 This toolkit draws on that experience, aiming to help companies understand the com- plex contexts in which they work, ensure they do not violate human rights, and strive to support peace through their op- erations," she added. The toolkit, according to the publish- er, draws on its experience of working with companies in a range of confl ict settings. Anglo American, Total, BP, Shell, Kosmos Energy, Newmont Mining, Barrick Gold, the International Council on Mining and Metals (ICMM) and IPIE- CA, as well as civil society and academic experts were consulted in the process of creating the guidance. International Alert quoted Mark Cuti- fani, CEO of Anglo American, as saying, "Anglo American places great emphasis on our responsibility to prevent confl ict and to respect and promote human rights in all areas where we work. International Alert's toolkit provides valuable guidance to help companies like us better understand our impacts in confl ict-affected areas, particu- larly in how we assess and respond to the risks in different confl ict types." The toolkit distinguishes between four broad types of confl icts that are partic- ularly challenging for companies: armed confl ict, armed violence, post-confl ict and social unrest. The type of confl ict, and its relation to the project, could de- termine the company's human rights im- pact. The 16-page document includes the following chapters: • Why confl ict sensitivity matters for HRDD (human rights due diligence); • Getting started: Designing HRDD in confl ict-affected settings; • Identifying and assessing confl ict risks and human rights impacts; • What happens now? Acting upon fi ndings; • Considerations for tracking and communicating; • Flashpoint briefi ng 1: Confl ict sensitivity and the pre-investment stage; and • Flashpoint briefi ng 2: Confl ict sensitivity and supply chain due diligence. NFPA: Fighting Fire With Knowledge The U.S.-based National Fire Protection Association (NFPA) is a global nonprofi t organization, established in 1896, devot- ed to eliminating death, injury, property and economic loss due to fi re, electrical and related hazards. NFPA delivers infor- mation and knowledge through more than 300 consensus codes and standards, re- search, training, education, outreach and advocacy. NFPA's international offi ces, covering the Asia/Pacifi c region, Europe and Latin America, work to advance the use and adoption of NFPA codes and standards throughout their territories.